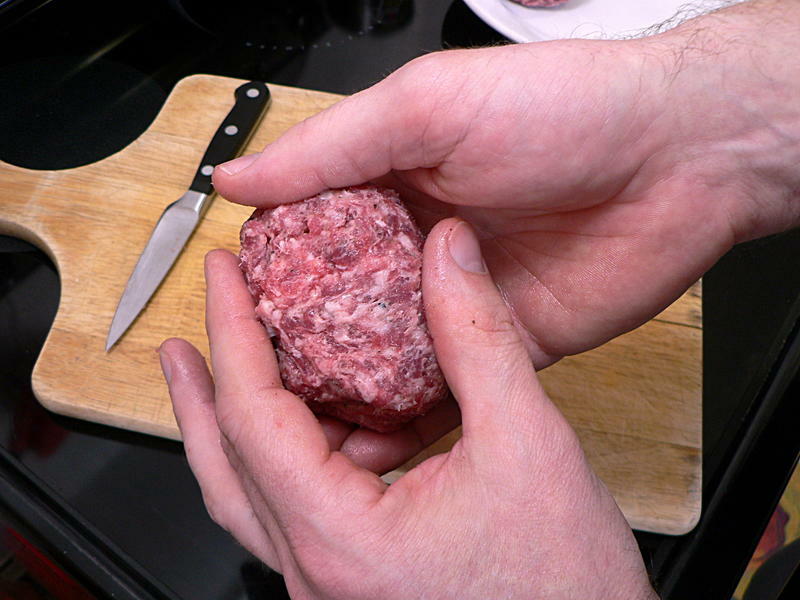 Sometimes you do things for other people that you wouldn’t do for yourself. 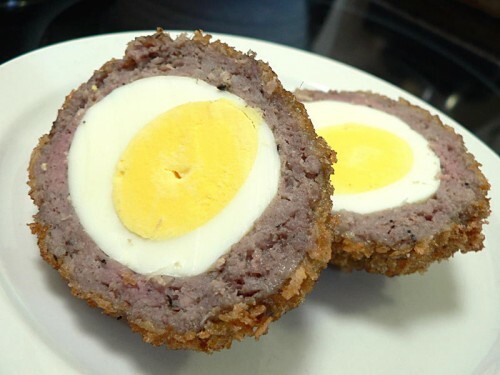 For me, Scotch eggs fall into that category. If I’m the only one eating it, I’m perfectly happy having sausage and eggs sitting next to each other. 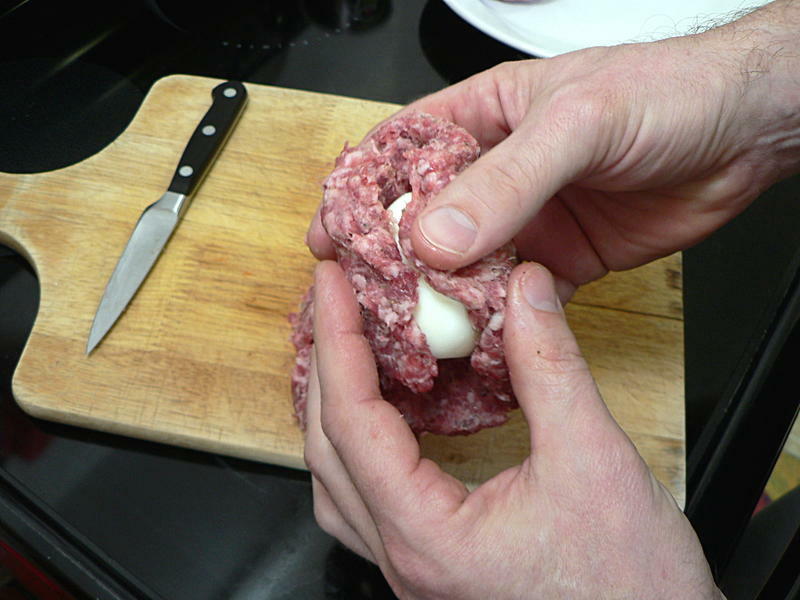 If you want a nice presentation, though, this does look pretty cool and isn’t all that hard to do. 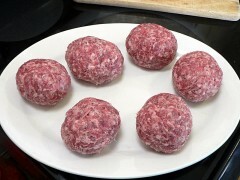 Divide the sausage into six equal portions. 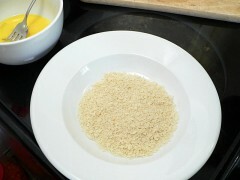 Press each portion into a round disk and wrap around an egg. 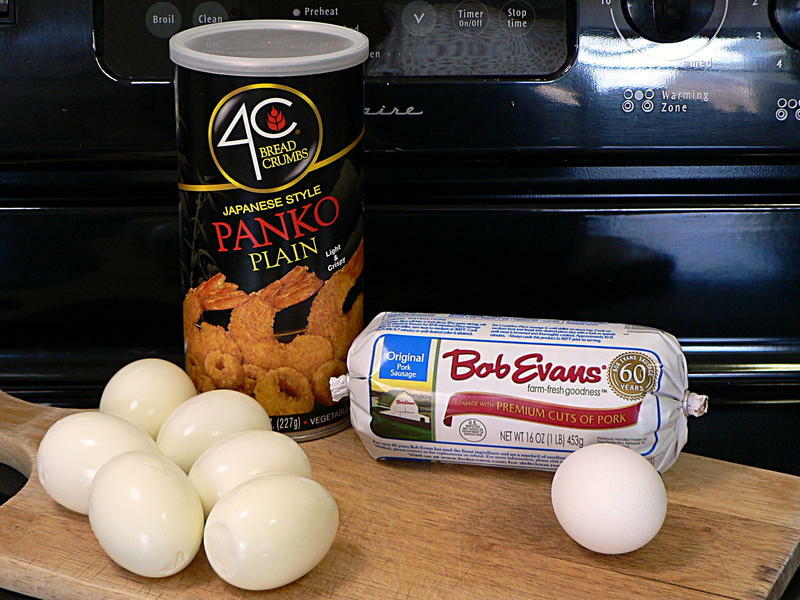 Put the sausage-wrapped eggs in the fridge while you get the rest of the ingredients ready. 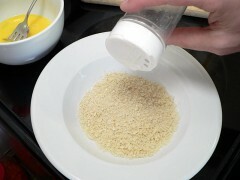 Season some bread crumbs with salt and pepper. If you’ve never tried them, panko crumbs have a lighter, airier texture that doesn’t absorb as much grease as regular bread crumbs, leading to a crispier finish. 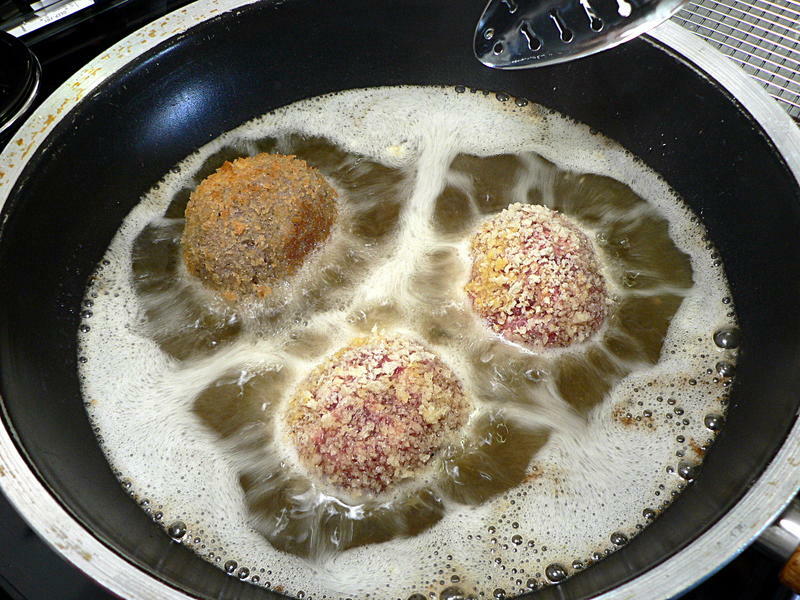 You might find them in the Asian foods section if there aren’t any with the regular bread crumbs. 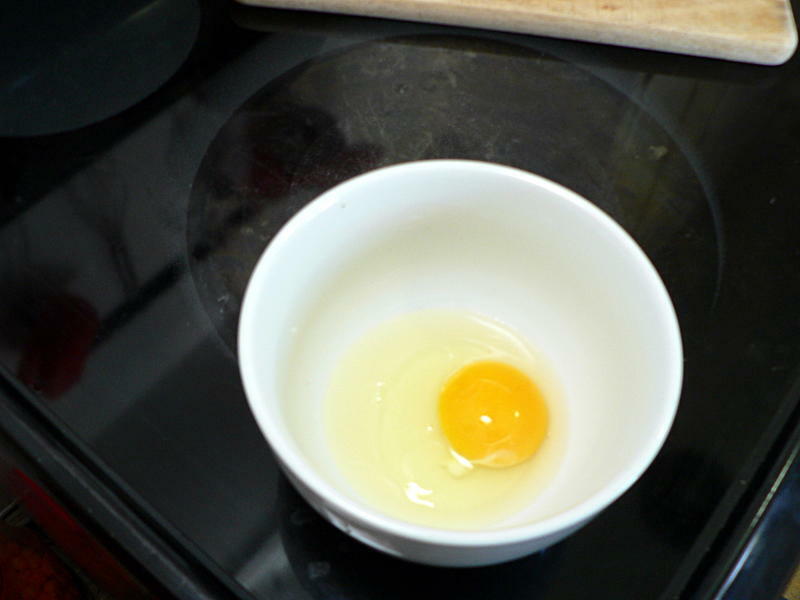 Beat the raw egg with a tablespoon of water. 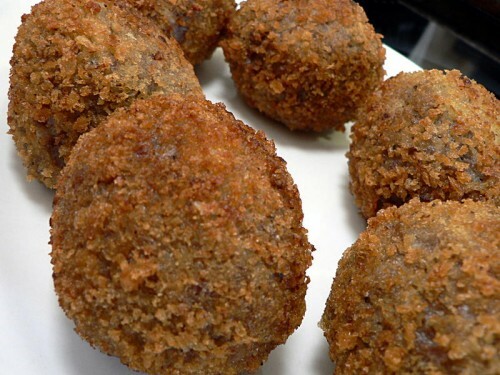 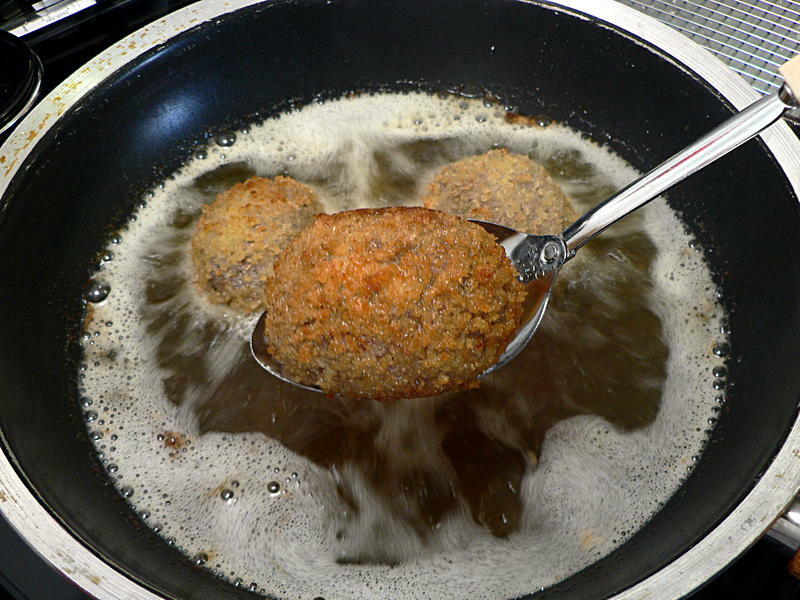 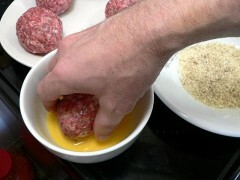 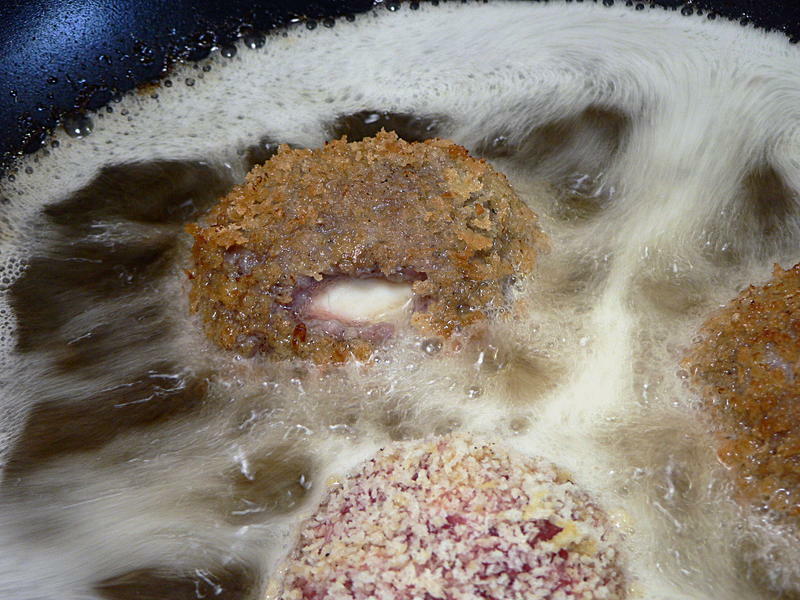 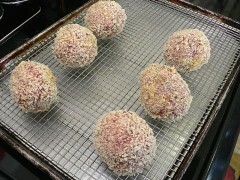 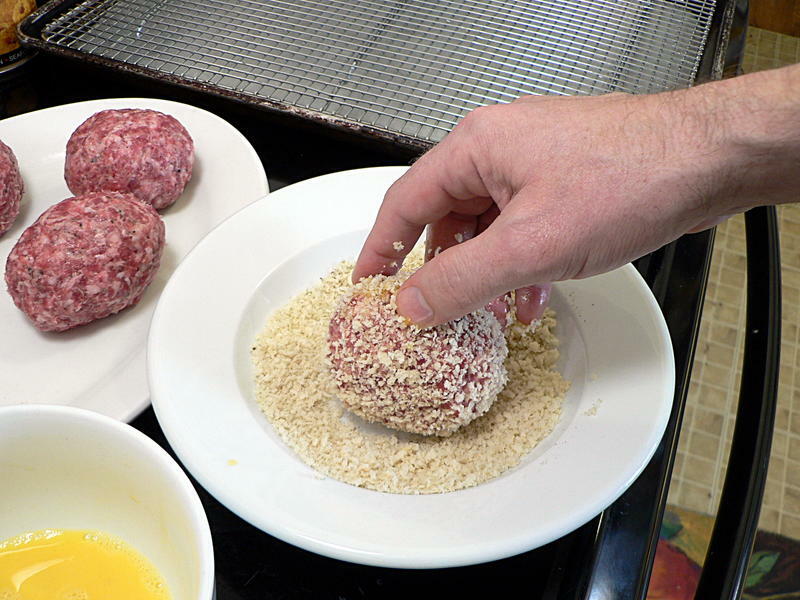 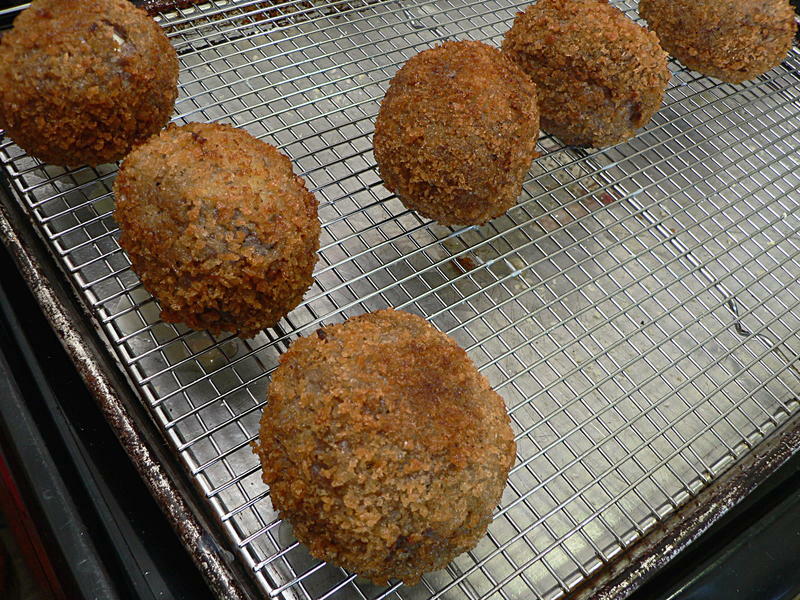 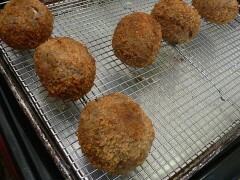 One by one, dip each sausage ball in the egg mixture and roll in bread crumbs. 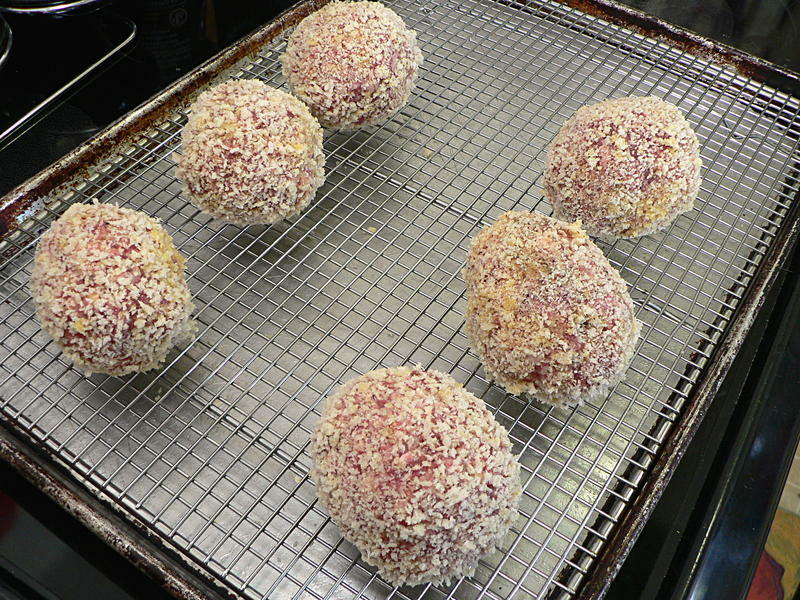 Set them on a rack to dry for about 10-15 minutes before cooking them. 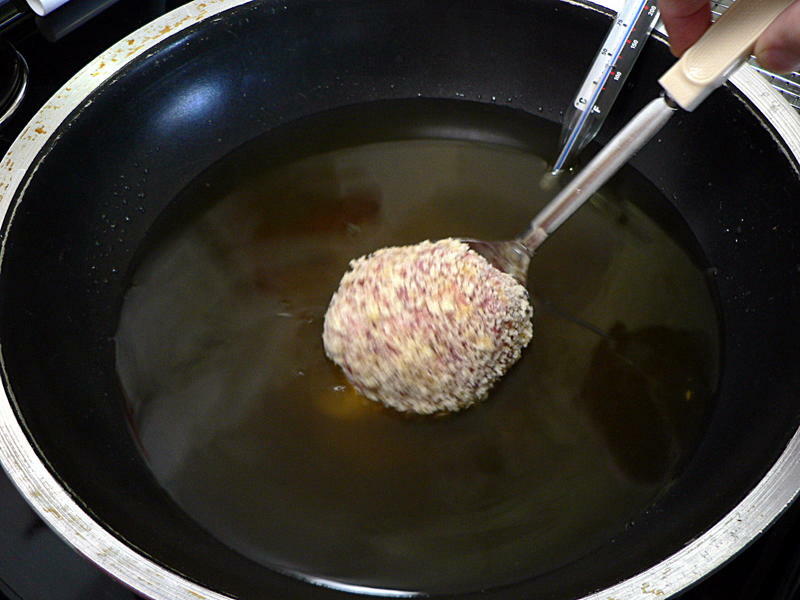 This helps the coating stick better when frying. 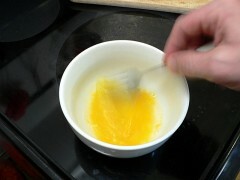 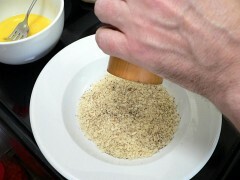 Gently lower each egg into the hot fat using a slotted spoon. Don’t crowd them, you want room around each one so they cook evenly. 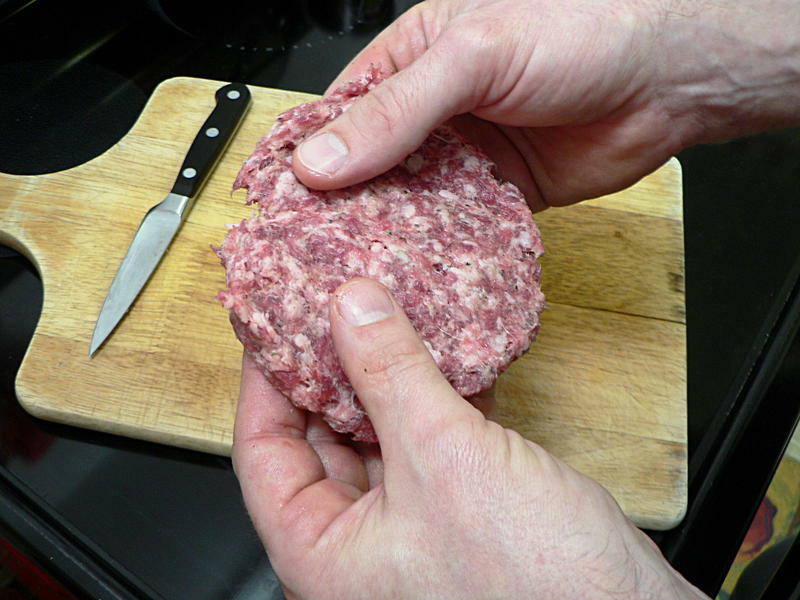 Turn them over to make sure they’re cooked all the way around. Scoop them out when they are deep golden brown. You may find that you had thin spots in the sausage which will come open as the sausage cooks. Don’t worry too much. 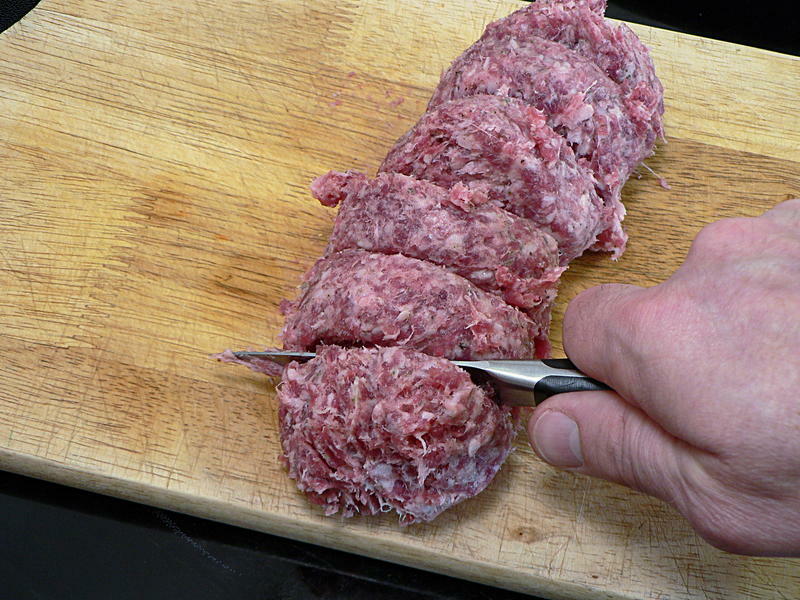 When you cut them to serve, just cut through the opening and no one will ever notice. 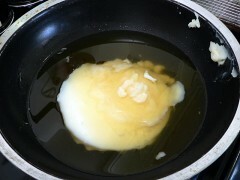 Transfer the cooked eggs to a cooling rack to let the excess fat drip off. 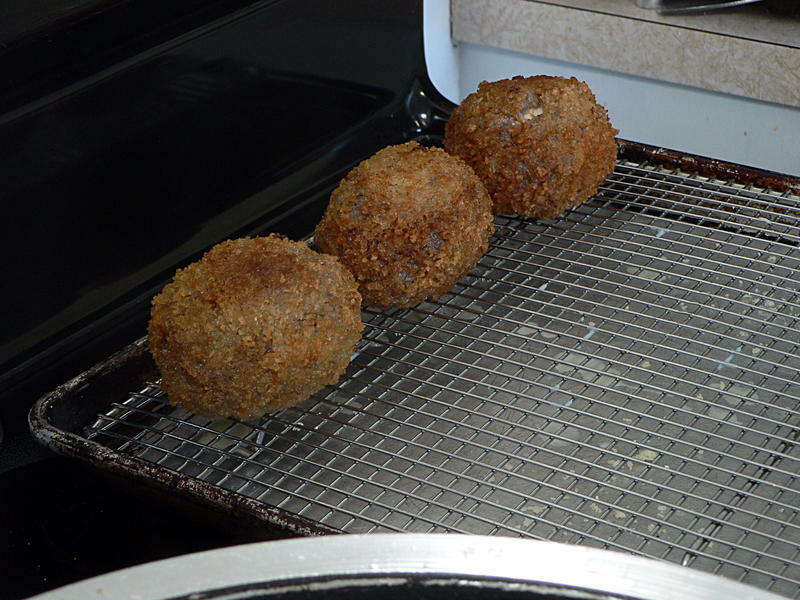 Serve as-is on a buffet. Or cut in half and serve as an hors d’oeuvre.